AleaSoft, January 14, 2019. 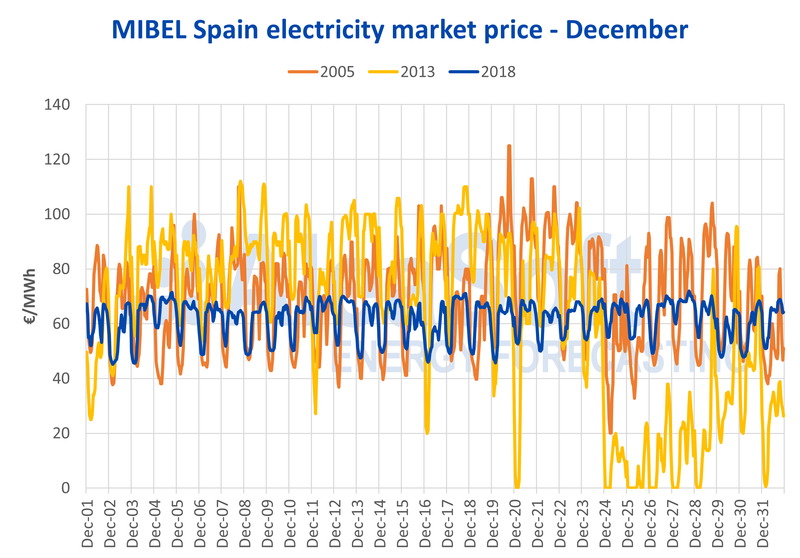 While the Iberian electricity market price increased in 2018, price volatility decreased, continuing the trend observed in recent years. 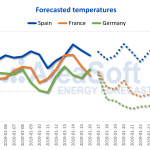 AleaSoft analyses the behaviour of the hourly price of electricity over the years, its main causes and its prospects in the coming years. Normally, what stands out most in a given year on the electricity market is its mean price. That value tells us how expensive electricity has been that year, but tells us little about the price behaviour hour by hour. A very clear example has been this year 2018. We have already read many news noting that 2018 has been the second most expensive year in the history of the Iberian electricity market MIBEL with an average price of 57.29 €/MWh, but if we look at the highest hourly price recorded during the year, 84.13 €/MWh, 2018 is in the sixteenth place, the sixth to last, and looking only the last decade is the second lowest. Looking at the lowest hourly price of the year, 2.06 €/MWh, 2018 is in the middle of the table, in position number twelve and with other nine years below it. With this data, we can already get an idea that 2018 has been a year with relatively stable and non-volatile hourly prices. A clear example is the comparison showed in our last publication last week, of the hourly prices in December of years 2018, 2013 and 2005. Sources: Prepared by AleaSoft with data from OMIE. The difference between the most and least expensive hours of each day can be used to measure the volatility or dispersion of hourly prices. This indicates the range that the price of the electricity market varies each day and we can see in which years or months prices have been more stable or more volatile, regardless of whether the price itself has been higher or lower than other years or months. 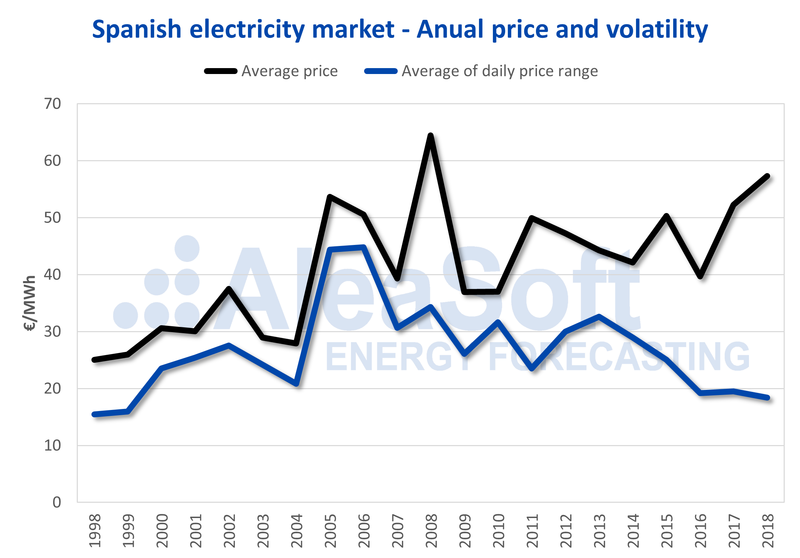 Analysing the following chart with the average annual price and the average price range within each day, two very clear trends can be observed in the Spanish electricity market. During the first half of the market’s history, until approximately 2007, the average annual price had a clear upward trend, and also did the range of hourly prices within each day. In this first stage of the market, where it was less mature and with fewer participating agents, prices were basically marked by the variable costs of thermal power plants. In those years, the average price range was proportional to the average annual price. But starting in 2009, the panorama changes. The upward trend of the price slows down a bit and, what interests us now, the dispersion of prices begins to decrease. That is, despite the fact that the level of prices has continued to rise slightly, the distance between the lowest prices of the day, usually during the early morning hours, and the higher prices, usually at the peak of the evening, has decreased. This behaviour of hourly prices in the last decade is due to several reasons. Among the main ones, it is worth highlighting the maturity of the market and the increase of its participants, which makes it more stable and less sensitive to the offers of a single agent, and also, very important, to the increase in the capacity of the interconnections. The international interconnections offers a buffer effect on the hourly prices: if the price tends to go up a lot compared to that of the neighbouring markets, then production decreases and electricity is imported at a lower price. In the same way, if the price tends to fall more than that of the connected markets, then it starts to produce more and to export electricity, preventing the price from going down. The dispersion or regularity of the electricity market hourly prices has a clear seasonal component. The most regular and stable prices are between May and September for most years. While the most volatile prices normally occur in winter, between November and February. 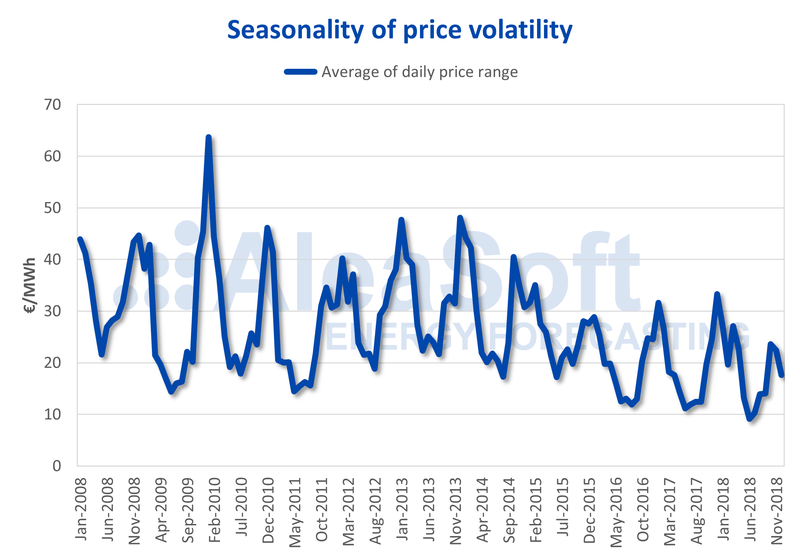 This seasonality of price volatility coincides with the seasonality of wind energy production which, being a non-manageable technology, introduces an extra variability in the matching of the hourly price. Looking at how the volatility of electricity market prices will evolve in the coming years and decades, all factors must be taken into account. On the one hand, there is the increase in the capacity of interconnections between European markets. As we have already mentioned, interconnections cushion and reduce extreme prices. 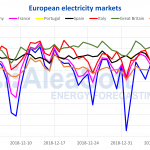 It is conceivable that the increase in the capacity of the interconnections for a greater integration of the European electricity markets will lead to a more stable and less volatile prices. But we must also take into account that the increase in renewable power, especially photovoltaic, planned to achieve the objectives of reducing greenhouse gas emissions, will introduce into the market a greater variability, as solar radiation is an unmanageable resource. This variability of renewable energy sources should be compensated by the flexibilization of the demand and the increase in the storage capacity of energy in batteries or as hydrogen, which will shift the demand of the hours with more expensive prices to hours with lower prices, making the daily curve of prices flatter and prices less volatile.